Our trustworthy entity is indulged in manufacturing, supplying, and exporting a qualitative range of Kitchen Chopper & Slicer. We carry out our operations from Rajkot, Gujarat, India. It is manufactured by using the best quality materials and cutting edge technology. We offer them to various hotels and restaurants, at a cost-effective price. 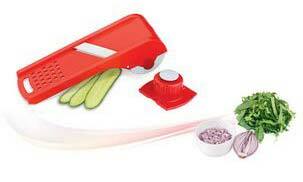 Our Kitchen Chopper & Slicer is completely in sync with the latest trends in the market. We have a great reputation for making timely deliveries of our consignments.